Published on January 29, 2019 in general info. 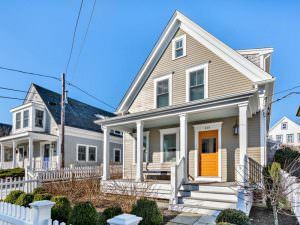 Closed Tags: Cape Cod Luxury homes, Cape cod real estate sales, Provincetown luxury homes, Provincetown new construction, Provincetown real estate. 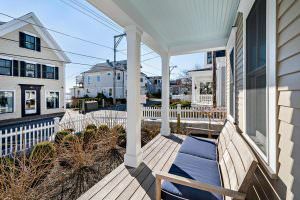 There are a handful of gorgeous single family houses on the market in town – 414 Commercial Street is a one of them. It has four bedrooms, three baths and is in the near East End on the corner of Law Street. It has 1,666 square feet and is being marketed for $2.049M. 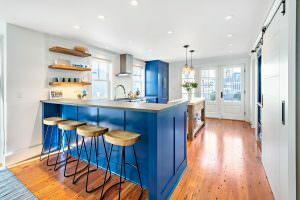 MLS REMARKS: Located in the heart of the gallery district, this light and bright antique was recently renovated to the studs and reimagined into a stunning 4BR 3BA single family home with high quality finishes inspired by period nuance. 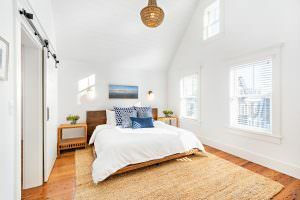 The interior boasts a spacious and smart floor plan, all living spaces tied together with gleaming reclaimed pine flooring and interior sliding barn doors used throughout the design. The first floor was built for entertaining, with the kitchen and dining being a grand open space separated by a bar-height counter with stools. The features of the chef’s kitchen will delight you: custom cabinetry, soapstone counters, integrated refrigerator, built-in pantry, Bosch appliances, and a locally sourced reclaimed wood island. All this while you enjoy glimpses of. Also on the first floor, an office/den, full bath, laundry/mud room, and a spacious living room anchored by a gas fireplace. Upstairs, the dramatic center hall with quality vintage lighting provides each of the three bedrooms spatial privacy from one another. At the front of the house, sunlight streams into the master, with a luxurious en-suite bath with limestone counters, a generous walk in shower, custom cabinetry and plenty of storage. The house is being sold turn-key with few exceptions, and offers a healthy rental history. It’s ready for the 2019 season! Listing courtesy of Seascape Realty.